Living the life in Belize! 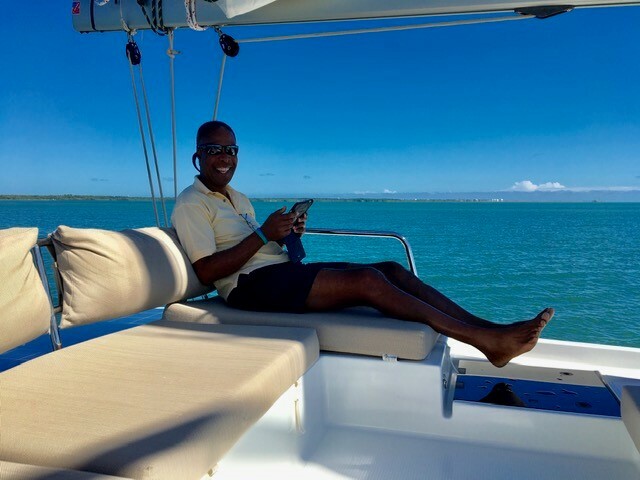 Christopher Patrick is the owner and COO of CKIM Group and has more than 25 years of experience organizing charters in the Caribbean, Mediterranean, and Pacific. I sat down with him to ask a few questions about his career as a yacht charter broker, what he has been up to the past couple of months (they were filled with charter shows) and what trends are on the horizon for the chartering industry. How did you get into planning yacht charters? I moved with my parents to the Virgin Islands from Guyana. I met friends who were involved in boating and I fell in love with the blue water and the white sand. In Guyana, the beaches were all brown near the ocean and the water was muddy. So to live in a place with these beautiful, clear water and white sand beaches, it was just a sight to behold. I fell in love with boating because we would go out [sailing] on the weekends. We would also go out racing and I just loved it. I continued to learn more about it working for Tortola Yacht Charters. What was striking is when you met people at the shows, the stories that they told and the level of satisfaction that they had on a charter vacation, was very fulfilling to me. Sailing and listening to the sound of the water and the breeze while falling asleep, it was just wonderful. I began to share this experience with friends that had never been sailing before. Some went on to get their captain’s license, others continued to sail. It created a lifelong memory for most of them. What do you like most about what your job? Being able to help people experience what it is like being on the water. One gentleman said that it was an incredible vacation because he didn’t have to shave and every day he just rolled off the back of the boat into the water and went swimming and snorkeling. It was the most relaxing vacation he ever had. Our last vacation we went on was a charter in Greece and a friend of ours commented on the fact that her husband was sleeping so well. She said “This is good. He is beginning to relax,” and that’s invaluable to know that you can help in organizing that type of vacation for someone. What are some of your favorite charter destinations? First of all, the British and U.S. Virgin Islands. There are beautiful beaches, shorter sailing distances, beautiful water, and if the wind is up decent sailing. And it’s still not crowded so far, calmer sailing, hopping to multiple islands within a day, I love it. I also love the Grenadines. It’s a bit more of an exhilarating type of sailing. What I enjoy about it is it’s close to what I imagine what the Caribbean used to be like. And you have this great combination of the music, local cuisine, and the people are warm and friendly. And then you get into the Tobago Keys. You can anchor and park the boat close to the shore and swim less then a minute and you’re on the beach, having a lobster barbecue. You also get decent winds. I find it’s very pleasant. Grenada too is great for sailing. Another favorite area is Greece. I love the culture, the food, the people are warm and friendly. And then there is the history. There is so much to see on every island. It is so rich in culture. Many days I think about going back there and sailing through that area again. What have you been up to the past couple of months? Every fall, going into winter, there are the charter shows in the Caribbean. At the beginning of November, there was the British Virgin Islands Yacht Show, which had about 50 yachts this year, mainly catamarans. There were some power catamarans, which are growing in number. They are great for charters in the Virgin Islands and in the Bahamas. One motor yacht that stood out was an 86’ foot Hatteras, which basically is a cruising sport-fisherman boat, but you can actually enjoy a great yacht charter onboard in addition to doing some sports fishing. The boat is called “One Net.” It was great to tour her and also, to see the progress at Nanny Cay after Hurricanes Irma and Maria. From the British Virgin Islands, we cruised over on Blue Horizon a Horizon ’60 powercat to St. Thomas. It was my first time on a cruising powercat. What was notable is that the captain could do everything himself with this handheld device. He could walk around the boat and drive it. That was very cool to observe. He docked the boat while handing the lines to the people on shore. That was really impressive. Plus, the boat was very comfortable during the voyage: a very stable vessel. The St. Thomas Yacht Show was larger than the BVI show. There were close to 70 boats there and wide variety, but mainly catamarans. A few motor-yachts, one, in particular, was “Lady Sharon Gale“, who has returned to charter after having some work done repairing the boat after hurricane Irma. One of the sailing catamarans that was really outstanding was the sailing catamaran, “Blue Gryphon“. We had heard about the boat for months and months and to be able to finally see her was amazing. She is very wide, has a lot of deck space, a lot of saloon space and she is actually heading to Tahiti next winter. She is 83 feet long and 40 feet wide. A typical catamaran is around 31 feet wide. A great crew as well. They are from Belfast, Maine. The boat is loaded with water toys like jet skis, paddle boards, kayaks. She will be sailing in French Polynesia next season and we are excited about offering her to clients. Throughout these shows, there is a movement of sustainability and conservation. At these shows, there are water, beverage and culinary competitions as well. Also during the shows, we are invited to lunches. And one of the lunches I had at the St. Thomas show was onboard a ’46 catamaran called “Firefly.” The captain is female, and the chef is a male. It was an outstanding meal that was very creative. I only eat plant-based cuisine and avoid oils. The chef took that to heart and prepared a meal that was outstanding. The dessert was cooked ripe plantain with a chocolate covered crust. I am dairy-free so it was dark chocolate with some sea salt on it. He could be a chef on a mega-yacht or a superyacht. We find this a lot: the meals on the smaller yachts often surpass those on mega yachts. Even though you are on a yacht that will charter for $15,000, you wouldn’t be compromising on the quality of the meals onboard. In December we had the Antigua Yacht Show, which was the big show. This year there were more than 70 yachts. Most of them being big motor yachts between 150 – 200 feet. Many of these boats were outstanding. I had this incredible meal aboard this super yacht “Amaryllis” and the dessert was all vegan. It was a vegan cheesecake which was absolutely delightful. Another boat that was extremely impressive was “Driftwood” with a young, active crew, all with specialties in extreme sports like kiteboarding and kite surfing. One of their tenders is a ’60 foot RIB tender. The décor inside the boat was very elegant. Another highlight from the Antigua show was going out on a motor yacht. A ‘130-foot boat called “Endeavour” and that was a wonderful experience. We went up to Green Island. It is a very protected anchorage. You can go paddleboarding, jet skiing and watch the waves crash along the reef. What are you seeing in terms of trends for 2019? There are more yachts returning to the Caribbean for the winter season and there were quite a few more yachts from the Mediterranean in the area. So many boats were damaged during Hurricanes Irma and Maria. The new boats that have replaced them are bigger, more luxurious and at a higher price point. You have a smaller number of boats at that $11,000 to $15,000/week range. In addition to that, the power catamaran market is growing. They are stable, spacious, and economical. The operating costs are much less than a monohull motorboat.